The greatly-expanded, newly revised, completely updated and re-designed publication detailing the deceptive marketing and billing tactics of rogue supplement companies is here. That’s right, “Dirty, Rotten Tricks! 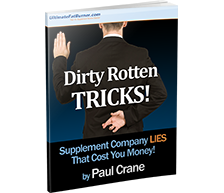 Supplement Company Lies That Cost you Money!” is ready to rock the supplement industry by revealing its dirtiest, most underhanded tricks! If you’re a fan of UltimateFatBurner.com, you’ll know that we discuss many of these very tactics on this site. Having been in the supplement review business for 14 years now provides us with a unique perspective; we’ve received hundreds – maybe even thousands – of emails from visitors who have been robbed, hoodwinked, fleeced, and swindled by one manufacturer / retailer or another. In this publication, we’ve taken all we’ve learned over the years, and jammed it into one tight, “fluff-free” volume. If you purchase any sort of nutritional supplements – either online or off – your biggest defense against unethical retailers is a good offense. And that means being an informed, educated consumer. If you are, no one will ever be able to pull the “wool” over your eyes! Be informed! Be forewarned! Be educated! You can learn more about “Dirty, Rotten Tricks! Supplement Company Lies That Cost you Money!” right here! We really appreciate your support! Purchasing this volume goes a long way towards helping us do what we do here! Thank you!